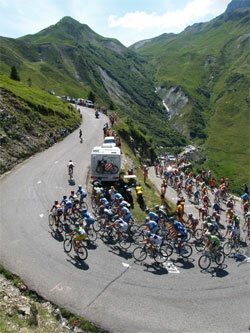 I first got interested in watching the Tour De France purely and simply because of Kraftwerk. They originally had a hit single about the race during the early 1980s. 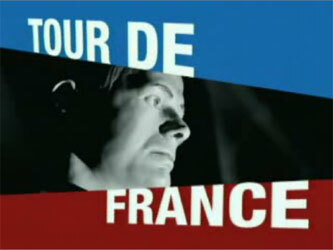 Then, rather out of the blue, they released their first album of brand new material for nearly 20 years in 2003, the cycling themed 'Tour De France Soundtracks'. A couple of weeks before it was released you could listen to the album via streaming on the BBC's Music site, and I can remember sitting at the kitchen table in my old house in Walthamstow, with my laptop hooked up to a dial-up connection, listening to a jerky low bitrate version of the new Kraftwerk album, and thinking, "Wow! The future they used to sing about when I was a kid has finally arrived". Still no as-promised hover cars yet, mind you, but I digress. 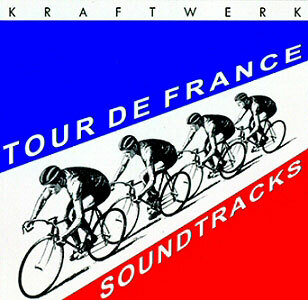 Kraftwerk gave a couple of promotional interviews around the time of the album's release, and in one of them Ralf suggested that the ideal way to enjoy the album was to listen to it whilst watching images of the Tour De France. I didn't actually ever do that, but it did make me look out for the highlights of Le Tour when it started on TV that year to see what all the fuss was about, and I instantly became hooked. There is something simply magical about the combination of the French countryside and towns, and the graceful way that the peloton passes through them. And then there is simply the unbelievable human achievement of what they are asked to do - cycling for between four and six hours a day, every day bar two for practically a month, including climbing the Alps and the Pyrenees. You'd have to be on drugs to do it. Anyway, leaving aside how clean the sport is, or isn't, it hasn't been so easy for me to follow this year's race. Greek television doesn't have any live coverage, or even a highlights package on terrestrial TV. If, like me, you've been practically run off the Greek road by careless drivers time and time again, you'll know that cycling isn't a big thing here. Luckily, we've recently discovered a bar around ten minutes walk from our house owned by a British couple who have Eurosport on satellite, and so I have been able to see three or four of the stages live. Other than that, though, I have been having to follow the progress of Le Tour via the internet, and so, during the course of this week, I wanted to review which sites have been the easiest to use, with the most features and the best coverage. Which internet site is wearing my virtual maillot jaune, who is just cruising with the peloton, and who have I awarded the dreaded lanterne rouge?